together, we can solve the paper cup recycling problem. Did you know that over 50 billion paper cups are sent to U.S. landfills EACH YEAR? 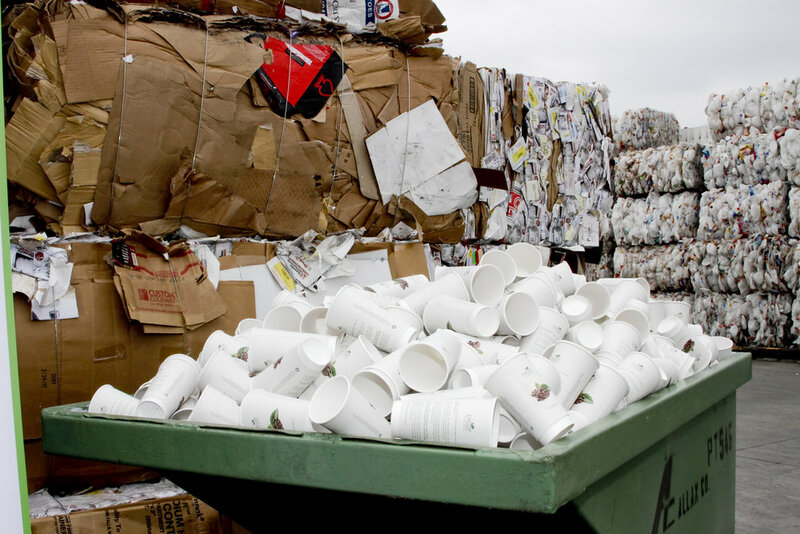 Traditional paper cups get diverted to U.S. landfills due to the difficulty recyclers have processing the plastic-coated paper cup materials through their existing paper recycling equipment. This results in approximately 700,000 tons of virgin paper cup stock being thrown away each year. The reCUP® Recycling Initiative aims to solve this problem by providing businesses, retailers, office buildings, schools and venues with a closed-loop collection program for reCUPs and other recyclable materials. Our goal is to divert as much waste as we can from our landfills and oceans. Currently, reCUP® Recycling Initiative partners are serving Los Angeles, Orange and San Diego counties, with plans to expand our program into Phoenix, Portland, Seattle and even the U.K. in the near future. For those of you interested in helping us to further expand our initiative, please contact us to discuss the details. We need your support in order to make the impact we hope to make. Learn about the paper cup recycling problem and how you can make a difference. Together, we can solve the paper cup recycling problem. Get started by using reCUPs as an alternative to traditional paper cups to reduce plastic usage and divert waste from landfills. Join our community and become part of the solution. We're in need of your support and look forward to working with you! Each year, over 50 billion paper cups are buried in U.S. landfills due to the difficulty recyclers have processing plastic-coated paper cup stock through their existing paper recycling equipment. The first step to getting paper cups recycled in the U.S. is to produce them from materials that are easy for recyclers to pulp into recycled paper using their existing recycling equipment. This is where Smart Planet Technologies comes in. Unlike traditional plastic-coated paper cups, reCUPs use a mineral-based barrier coating called EarthCoating® that makes reCUPs easy to process through todays existing recycling infrastructure, while using 51% less plastic. The next step is to increase reCUP usage so there are lots of them for recyclers to collect. This is where you come in. Once you start using reCUPs, we'll add you to the list of locations our recycling partners can pick them up from. The more businesses we can encourage to participate, the more of an impact we can make. Now that reCUPs are valuable to collect, reCUP® Recycling Initiative partners are ready to provide businesses, retailers, office buildings, schools and venues with a way to use less plastic and divert waste from our landfills and oceans. For every ton of paper recycled, we save the energy equivalent of using 165 gallons of gasoline.